(York, Pa., March 14, 2018) - The York Revolution have added three more players to their 2018 roster, signing left-handed pitcher Ross Detwiler and right-handed pitchers Josh Kimborowicz and Chris Dula. The signings were unveiled by manager Mark Mason live on Tuesday night’s episode of “Revs Hot Stove Weekly presented by Shipley Energy” on SportsRadio 1350 WOYK. Detwiler spent nine seasons in Major League Baseball (2007 through 2016), including seven with the Washington Nationals. He played his college ball at Missouri State University and was the sixth overall pick in the 2007 MLB Draft by Washington. Detwiler’s best season came in 2012, when he went 10-8 with a 3.40 ERA and 105 strikeouts, logging 164.1 innings over 33 appearances (27 starts) for the NL East-champion Nationals. The 6 foot 3 southpaw has appeared in 189 Major League games in his career, starting 89 of them, and made at least 30 appearances in a season three times. 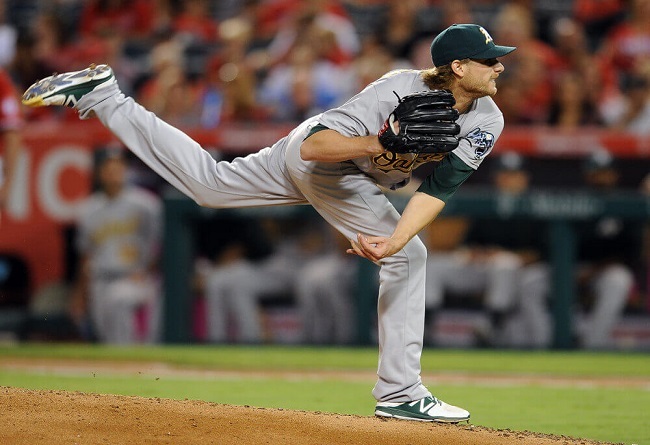 Detwiler spent the 2017 season in the minors with the Chicago Cubs and Oakland Athletics organizations and appeared in 19 games. “Having those type of players around with that type of experience level and that pedigree, that helps a lot of the younger guys,” Mason said. “Certain guys can teach you how to go about your business and be a professional in all facets. Kimborowicz was drafted out of Everett Community College in the 19th round of the 2013 MLB Draft by the Tampa Bay Rays. The right-hander pitched at four different minor league levels over three seasons in the Rays’ system, reaching High-A in 2015, where he posted a 2.62 ERA in 37 innings out of the bullpen. Kimborowicz began 2016 in the Los Angeles Dodgers farm system before joining the Southern Illinois Miners of the Frontier League. Kimborowicz was dominant for the Miners, going 8-0 with a 2.34 ERA in 10 starts. Dula returns to York after pitching in nine games for the Revolution in 2017. Dula had a 3.12 ERA and gave up just four hits over 8.2 innings of work before joining the Gateway Grizzlies of the Frontier League, where he made one relief appearance. The hard-throwing right-hander was a 25th-round pick of the Texas Rangers in 2013 and spent parts of three seasons in the minors, reaching Single-A in 2015 before finishing the season in the Australian Baseball League. “With a guy that has that type of arm and velocity, we’ll take a look at him in camp. (If he can) just let his natural ability work for him, try to repeat his mechanics, if he can do those things he should be fine,” Mason said. The Revs now have 18 players under contract for the 2018 season and will unveil additional signings on the next episode of “Revs Hot Stove Weekly presented by Shipley Energy” on Tuesday, March 20, at 6:30 p.m. immediately following “The Baltimore Baseball Show with Dan Connolly” on SportsRadio 1350 WOYK and www.woyk1350.com.